With non stop flights form so many East Coast destinations, The Turks and Caicos Islands, have always been a perfect solution for my clients seeking exceptional sand and water experiences with relative ease. With so many outstanding accommodations on the islands, I decided to travel down on a bit of a reconnaissance mission. The great news is that with each property having such vastly different character, personally experiencing the resorts that my clients most request, I can better help them with the best fit for their needs. First impression – it is an easy to get to island and the locals are for the most part very friendly and accommodating. Sand everywhere is exceptionally soft and powdery white, water clear and delightful – the island’s claim to fame! My first stop was at the sleek and private Amayara Resort on the remote Northwest point of Providenciales (Provo to the locals). 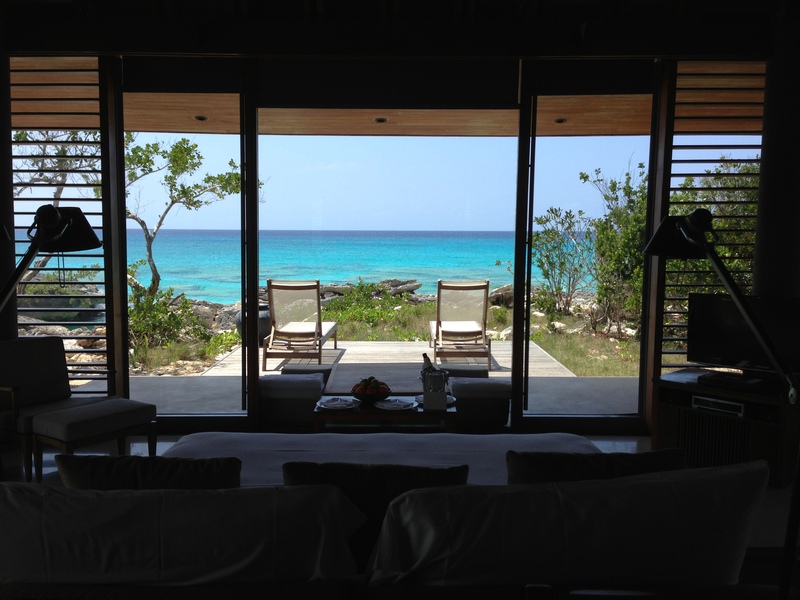 Amanyara is for couples, families and even singles looking to relax and unwind in a perfectly serene environment. Service is spot on, the food while expensive is exceptionally good, and the entire setting is a tranquil and beautifully designed oasis of serenity. But that does not mean it is boring. Even when the resort is running 100% you might not ever feel it. The individual pavilions have either a pond, pool or beach front setting and are completely private. There is great space indoors and many lunge areas to read, have breakfast, or cocktails all whilst taking in the natural surrounding. The flora and fauna is all native and rather rustic looking – organized but purposefully left to show off its native side Signature sleek ponds and pools that are so “Aman-esque” pervade. My pavilion was my favorite of all the room types I saw because we had a rocky bluff for sunning but below could sit and swim in a sandy ocean alcove, with complete privacy. The food is fresh and true to its origin and expertly served at the beach club, in your pavilion or in the main restaurants. Multi bedroom Villas are sleek, chic, and wonderful for families and groups of friends, each with a personal host and chef assigned to care for every desire. 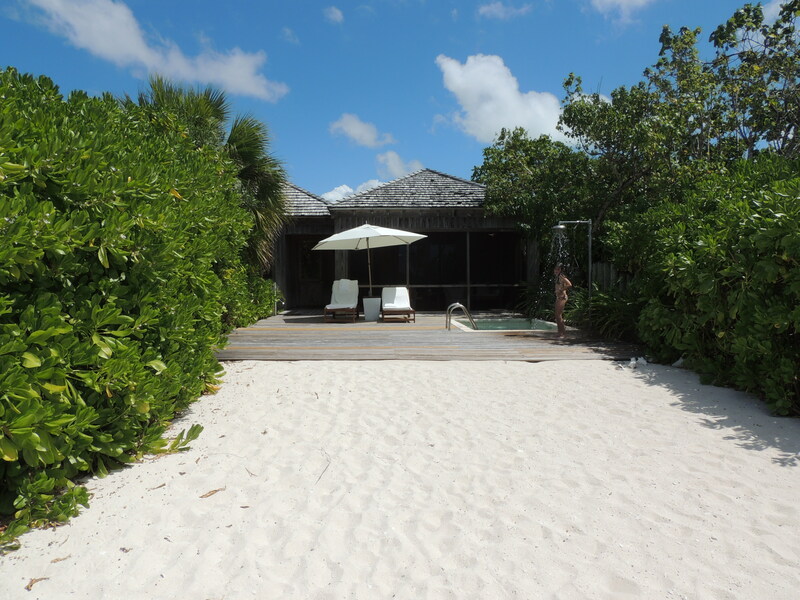 I love my private beach at Amanyara! Salute! Children are well taken care of at Amanyara and there is a daily complimentary program for children that focus on ecology and the environment in the morning and games and water sports in the evening. This is a completely complimentary service and is customized depending on the number of children and ages and interest. BEACH REPORT: Each room is located on a completely different geological setting – pond, garden, ocean and even the ocean experience can change depending on the tide and the year. Some of the accommodations have private cliffs or beach coves to enjoy. The best beach experience is located at their beach club and restaurants. 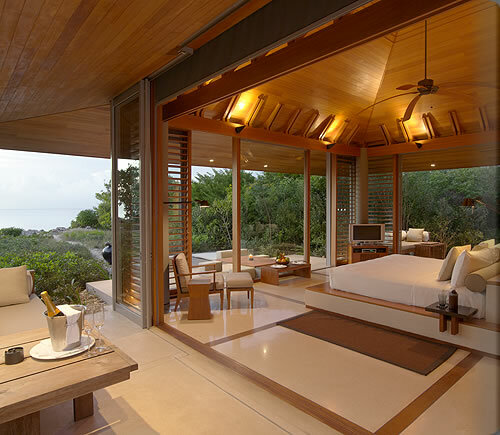 AMANYARA GUEST LIST: Jet Set guests who have an eye for design, are well-traveled, and want exceptional service and accommodations. Guest staying here are happy to enjoy all the food and beverage and activities on property, rather than having easy access to town. They want a peaceful and sophisticated vibe, wonderful cuisine and understated elegance. Gansevoort is located on a beautiful stretch of beach on Grace Bay and is coined the hotel where urban hip meets Caribbean chic. The clientele is young, fit and yes, hip. The property is small, simple and easy to navigate. The service is unassuming, friendly, and easy-going. This is the place one goes to people watch and be seen. The pool is the focal point and visible right from where you pull up to the front door. All of the rooms are located in one of the two short towers flanking either side of the pool and nearly all are ocean-view. The smallest room type is a studio with kitchenette and goes all the way up to 3-bedroom penthouse with great deck space, hot tubs, and views. The music has a club vibe and the blender is always purring at the bar. For those that are seeking more serenity, the beach is gorgeous and you can get set up on a round lounge chair with an umbrella to pass your day. We met lots of interesting people, with a large proportion from New York, likely due to the brand penetration of the two Gansevoort properties in Meatpacking and 5th Avenue. BEACH REPORT: Same gorgeous powder white sand as found throughout these islands. 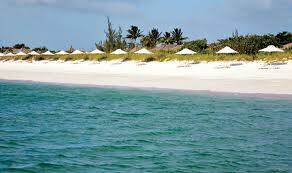 Grace Bay is a developed beach area so walks will not be secluded but long walks along the coast line can be enjoyed. Beach chairs and service is available. Expect to pay for the fancier rounded chaise lounges for two. GANSEVOORT GUEST LIST: Successful young urban business people, many from NY. Couples who like to socialize and have fun, girls and guys get-a-way weekends, families with older kids who like to feel a part of the scene, those not seeking a remote or secluded setting. 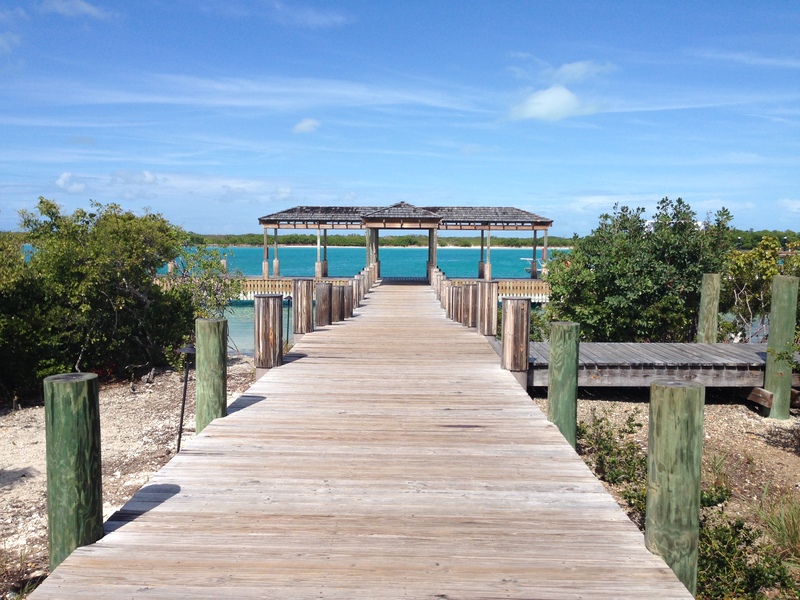 On arrival at Parrot Cay, we are whisked away on golf cart to our Beach House. I could get use to the fantastic butler service at Parrot Cay – with Dewa and Christo from Bali. Finally, we took the boat from the Leeward side of the island which is private for Parrot Cay and enjoyed the 25 minute speed boat ride to this island of dreams. On arrival our butler, Dewa, met us and took us for check in directly at our Beach House with Pool. (this is an incredible service provided to guests of the beach houses and villas). Dewa, we were quickly to find, was with us to serve us any meal, to arrange any spa treatment or reservation, to show us around the property, and even to find a lady in room service to braid Isabella’s hair). He was incredible and while I certainly don’t deserve the services of a full time butler is was a wonderful experience to have Dewa appear out of thin air!). 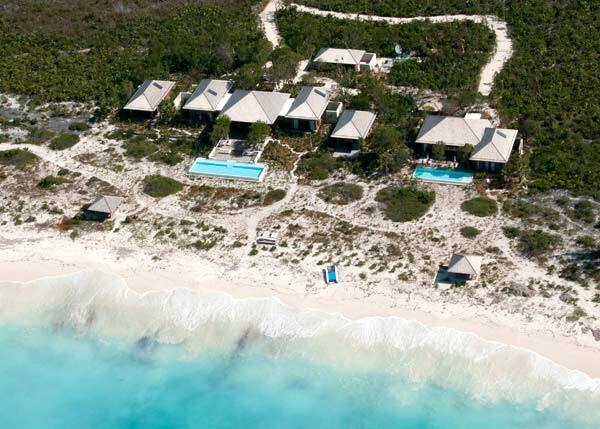 But that is not what makes Parrot Cay so special – it is the fact that it is so relaxing, so unassuming, so fabulous with an appearance of not really trying. The design is so comforting and understated that you could check in and just read a book, or write on perhaps, and never feel like you were splurging (though of course, you would be!). Guests come here for peace of mind, wellness, relaxation, for frolicking on incredible empty beaches, and oh, most definitely they come here for the food. This is the best cuisine I have had in the Caribbean!! The options are so interesting with a strong emphasis on local and Asian flavors in Lotus and with Italian Mediterranean on the Terrace but most important to mention is the most fantastic options in both restaurants from the coveted Shambala Menu – power food for mind and body but beyond delicious!!! Some of my favorite meals were from this menu and who knew that eating so healthfully could taste so wonderful – My lunch today Raw Tuna, seaweed, avocado and cabbage salad with fresh soy beans and Japanese inspired dressing or last night, I devoured the Grilled Spiced salmon with cauliflower, quinoa and pomegranate tabbouleh wiht smoky eggpant puree, or breakfast this morning, the corn and cilantro cakes topped with avocado and smoked salmon! Can you say, yum?! 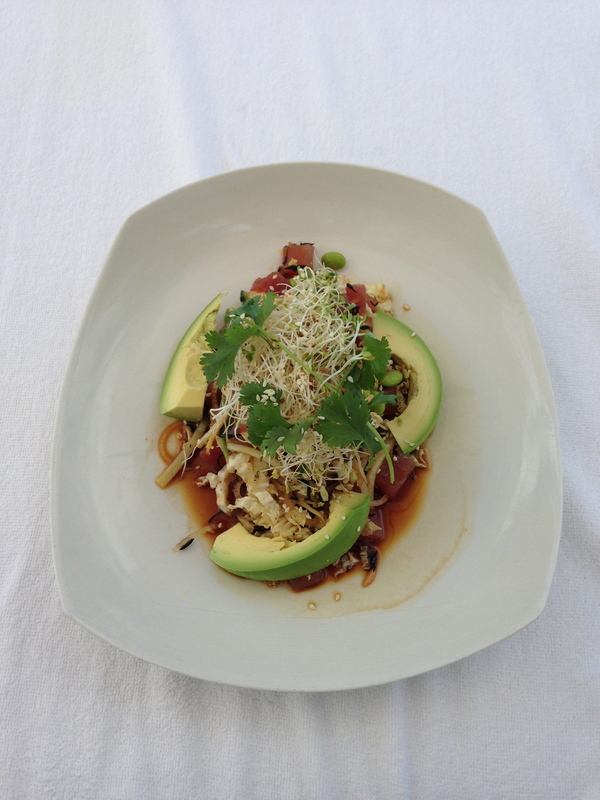 Lunch from the healthful Shambala menu available always and anywhere. Quite possibly the best cuisine in the Caribbean! 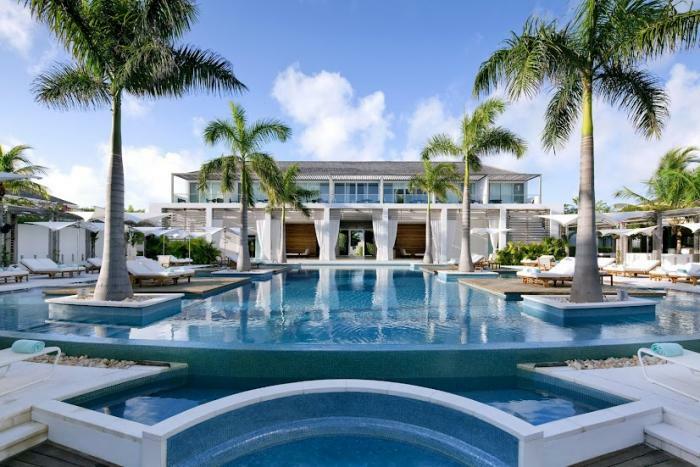 So, let me get back to the Wellness, there are many well-known wellness retreats but again that is also what Parrot Cay does so well, but in a way, like everything else, is understated. The spa, or Shambhala retreat is a simple 2 story wooden building with spectacular views harmonizing with nature. The treatments are experts and range from full Ayurvedic consultation, Shiatsu, Indonesian, Thai, and Indian treatments, acupuncture, baths and multi hour and day rituals. Daily complimentary yoga and pilates classes are offered and guests can focus 100% on wellness or not at all during their stay. Several multi room villas are available for families and friends but the most breathtaking WOW experience is designer Donna Karan’s 11 room Sanctuary – spectacular for a BIG birthday or destination wedding or multiple families. Overall, this is a fantastic retreat with impeccable service, gorgeous beaches, and terrific yet informal service. The Eleven Bedroom Sanctuary – this would be a spectacular setting for a BIG birthday or destination wedding! BEACH REPORT: Endless secluded walks along miles of uninhabited silky white sand beaches. Serviced lounge chairs at main beach area. More private beach chairs in front of villas which can be serviced by your 24/7 butler when staying in the 2-bedroom of larger units. Playing on the dunes, the beach feels like it is just ours! Very busy CEO’s and Executives who want to escape from everything and just be themselves, couples wanting romance and relaxation, families with kids who want to be in a beautiful, natural place to play, mother-daughter trips, or singles seeking peace and time, definitely those wanting to focus on wellness and healthful living. Saying good bye will be the hardest part! Serenity surrendered! Until next time Parrot Cay! Stunning! These resorts look like a dream come true!